CM: Despite Spyros Moschoutis' known tendency of creating anticonventional artworks, his present Self-Portrait stirs the beholder in an unusual way. 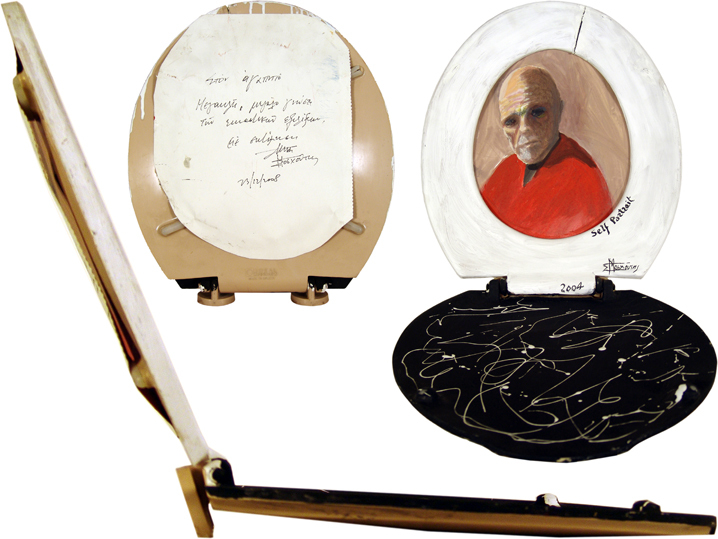 Moschoutis framed painted portrait in the found seat of a toilet using the lid as counterbalance. As a matter of fact on the lid he created an action painting - white colour dripped on black background - as homage to Jackson Polock. It is worth admirating Moschouti's inventiveness and his belief that "anyhting may lead to visual delight". Moschoutis' genuine thought transforms the worthless remnant of a disused toilet into a masterpiece of contemporary art. He claimed that the frame, as it inflates around his face, serves "as a 'life jacket' from the pointlessness of art". The painted head has a plaintive bent and looks at you in a mood of invitating you to his side. His deep eyes express one of art's great issues today, the tension of not recognizing - if not underestimating - any good work.